The cast of the Theatre of the Republic’s musical celebration performance in January, which kicked off a year of commemorating their 50th anniversary. The bright marquee lights up Main Street and lures couples, clusters of friends and others down the sidewalk like a beacon on this chilly January evening. 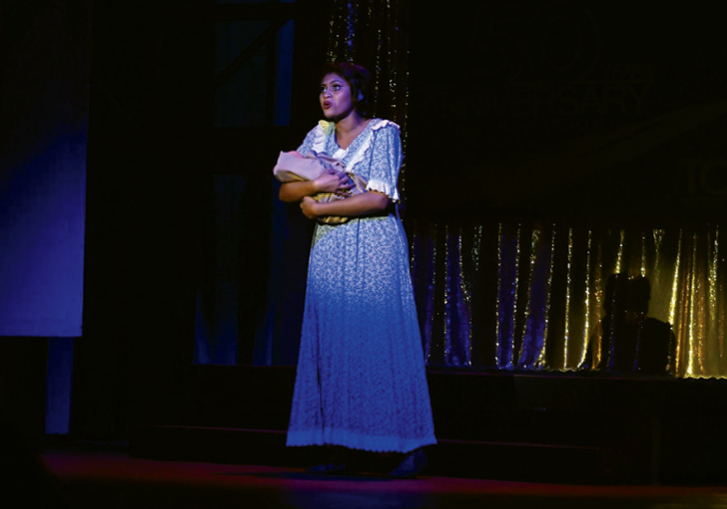 They are eager to take in not just another stellar live performance at the Theatre of the Republic, but take a trip down the theater’s memory lane and kick off the year-long celebration of its 50th anniversary. For nearly three hours, performers belt out a medley of tunes from such notables as Finian’s Rainbow—the theater’s first performance 50 years ago—to its most recent show, Footloose, and everything in between. For half a century, this little community theater has entertained residents with musicals, comedies—you name it—and given a stage to the otherwise hidden talents who call Horry County home. The theater started with a simple love of the arts and a determination to make sure the arts had a place in Horry County. Folks took in the performances in barns, restaurants and the popular Sidewheeler. “Wherever they could find a place to put on a show, they did,” McGhee said. The non-profit had the chance to move into what was known as the Holliday Theater on Main Street in Conway after it burned and was gifted to the Theatre of the Republic to rebuild. Most community theaters aren’t lucky enough to own their theater, McGhee said. “We are pretty proud of it,” he said. 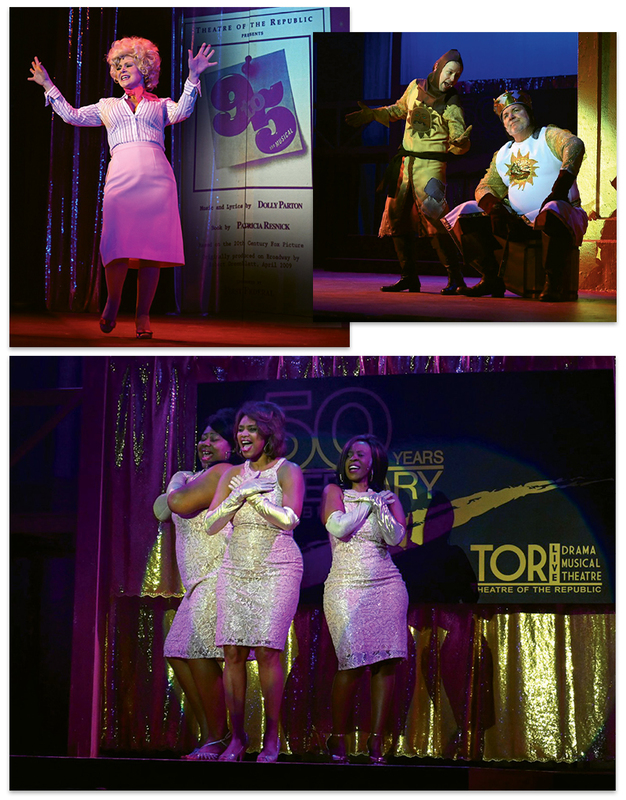 Clockwise from top left: Tishala Martinal sings a piece from the Dolly Parton hit 9 to 5; Patrick Miller and Bobby Kelly perform a scene in Spamalot; Ashley Hughes, Monique Burgess and Sasia Manigo as the Dreamgirls. Making the most of the unique opportunity, the theater raised $1 million and bought the spot next door for offices. After the stage was built but while renovations continued, the theater put on a special performance of Dracula under the stars—there was no roof and no seats installed yet; patrons sat in lawn chairs, McGhee said. Now, the 300-seat theater is often sold out for the performances. Though known for its musicals, the theater aims to offer a variety of genres—a diversity that McGhee says has helped the theater make it as long as it has. Other than a few paid staff members, the theater relies on volunteers—from the actors, costume makers, stage designers and greeters. “There’s so much to do in the theater,” McGhee said. Fans who regularly fill the seats say they are blown away that the performers aren’t professionals (they do these performances on their own time) and the dedication of all the theater’s volunteers whose passion is contagious. The theater has regular auditions for its performances, and, thanks to Horry County’s booming growth with people moving to the area, always attracts new folks wanting to hit the stage, McGhee said. It takes between 25 and 35 people to put on one of the theater’s popular musicals. Performers rehearse five days a week for six weeks before the debut, McGhee said. “We would not be here without those volunteers,” he said. The non-profit has a roughly $500,000 annual budget, with money coming from grants and accommodations tax revenue, but the bulk of it, about 85 percent of the budget, comes from ticket sales. Tickets for a show are roughly $25 to $30, McGhee said. Funding has, and likely always will be, a challenge for the community theater, he said. There are the costs for insurance and maintenance on the building, as well as production costs and the fees to buy the rights for the musicals. Technology also could be a challenge as the theater heads into its next 50 years. Broadway productions now feature impressive visual technologies that the Theatre of the Republic simply can’t duplicate with its current equipment. But McGhee hopes the Theatre of the Republic will continue to have its niche in Horry County. It simply has to. While it has its devoted followers, many residents still don’t know about the Theatre of the Republic and the quality of performances it offers, some fans said. McGhee said the theater wants to get the word out to all the new residents who relocate to Horry County, one of the fastest-growing areas in the country. “Unfortunately, there are still a lot of people who don’t know who we are,” McGhee said. Whitney Daniels performs a song from Ragtime for the 50th anniversary kick-off celebration. Allan and Linda Pomicter, who moved to Myrtle Beach about five years ago, were regulars at theaters in the big cities near where they lived, including theater meccas such as New York. They decided to try Theatre of the Republic shortly after they moved here. The pair, who attended one of the trio of 50th anniversary kick-off performances in January, had this advice for the theater’s next 50 years. Editor’s note: The Theatre of the Republic will have special performances and events throughout 2019 to commemorate its 50th anniversary. Stay up-to-date by following the theater on Facebook or signing up to receive email updates by contacting Tim McGhee, executive/artistic director, at tim@thetor.biz.